Decent design with budget specs? BlackBerry C-series: specs of the Q5 with no QWERTY in sight? BlackBerry isn't doing so hot, with losses and layoffs in its future, but the latest leak says that its next scrabbling handhold on the receding cliff face of profitability is a new budget line called the BlackBerry C-series. The BlackBerry C (code name: Americano) is said to combine the best existing BlackBerry 10 devices like the Z- and Q-series phones: sleek design with budget specs, respectively. That will keep the BlackBerry C series looking fresh to consumers while appealing with a lower price point than the high-end Z-line, like the just-announced BlackBerry Z30. Or at least, that's reportedly the idea. If it's true, the Americano will be mucking about in the just-released iPhone 5C's neck of the sea, which may not be the best place to tread water right now. News broke today that BlackBerry has agreed to an initial offer that could see it bought and taken private again by a group led by financial holdings company. That pretty-big-deal news didn't stop leaks of its alleged smartphone plans, however. As far as detailed specs, we've got little to go on where the BlackBerry C is concerned, besides the promise of specs similar to the chunky, QWERTY-equipped, budget-priced BlackBerry Q5. Besides that, the only morsel is that the initial BlackBerry C-series device will reportedly have a full-sized 4.2-inch 720 x 1280 touchscreen, no QWERTY and 4G LTE compatibility. 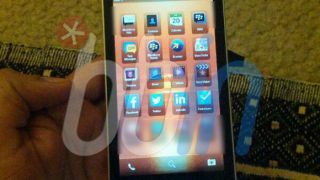 The phone is said to be in testing stages currently. Word of the BlackBerry C-series fits perfectly with the company's recent admission that it will back off from the consumer market soon and release just four new phones in the future, instead of the previously planned six. Of those four unannounced devices, two are high-end offerings and two are entry-level phones, like what the BlackBerry C is being described as. Comparisons with the iPhone 5C will be inevitable (imagine if they call it the BB C5? ), but the "budget" iPhone has done pretty well for itself since its launch alongside the iPhone 5S this past weekend. Combined sales for both new iPhones hit 9 million in just three days, though Apple isn't detailing the exact split and TechRadar's digging indicates tentatively that the higher-end iPhone 5S is, in fact, in greater demand. BlackBerry could really be sold - the company actually found a suitor and agreed to an initial offer that would take it private.